Multi Marine, Ian Bevan, Darren Newton. Jib has a single reef point. - Construction Type other; GRP & AIREX Foam configuration. - Hull Finish other; Gel coat + Spray paint finish. This is the background to the building of the racing catamaran " Lilly". Having been a keen racer on the Dart 18 circuit for five years I wanted to race a bigger vessel. Nothing suitable was available. I knew Derek Kelsall and liked his designs and decided to build the KSS-R-30 to his plans. Construction began in an environmentally controlled industrial unit in Abbergavenny in 2004. Building went ahead, to the designer's specifications, using 12mm Airex foam as the core of his Kelsall Swiftbuild Sandwich technique. After dry fitting the hulls were transported to Multi Marine, Plymouth where Darren Newton's company carried out the bonding. Darren has vast experience in multihull building . The construction and rigging were completed according to the plans and sea trials took place. After satisfactory conclusion she was sailed to Milford Haven, UK, where she now lies. She was successfully raced locally, and day sailed, but, overall very lightly used. She will make you smile in a anything between force 4-6. A very quick boat indeed. 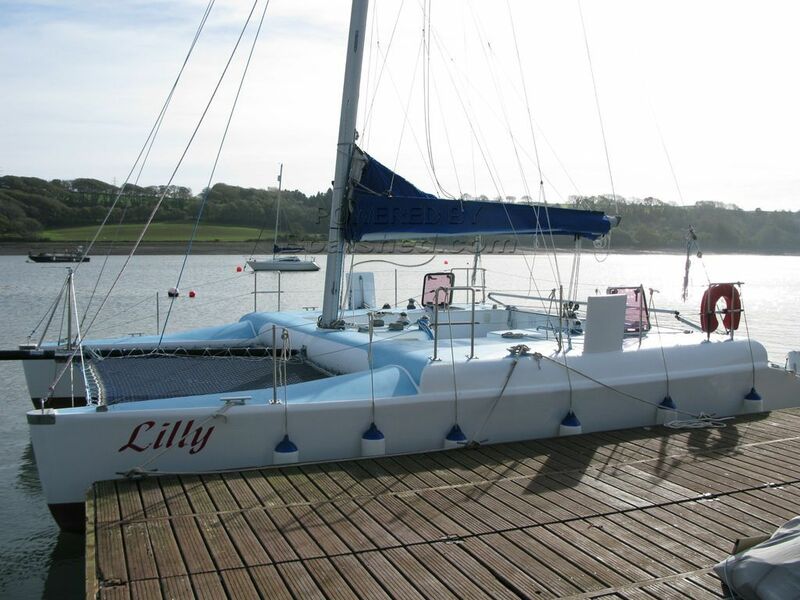 This KSS R30 Open Deck Racing Cat has been personally photographed and viewed by Mike of Boatshed Wales. Click here for contact details.